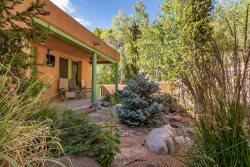 This charming two bedroom casita is the perfect setting for an immersive Santa Fe experience. As part of a main house built in 1898, Casita Rosario has authentic beauty with modern amenities. Relax in the two beautiful courtyards, enjoy modern lofty interiors, build a fire and re-center your spirit in this peaceful space. In a leisurely 8 minute walk from the historic Plaza and on the way to Ski Santa Fe and great outdoors, enjoy being in the center of everything. Guests can access the home through the private courtyard gate on the west side of the garage and can enjoy the front and back courtyards, and the entire guesthouse! I provide self-check-in instructions 2 days before check-in, but I'm always available by phone! - Please no shoes in home and no smoking. Some spaces are shared - Guests will have one parking space on driveway to the far left and have to park in a way not to block garage.